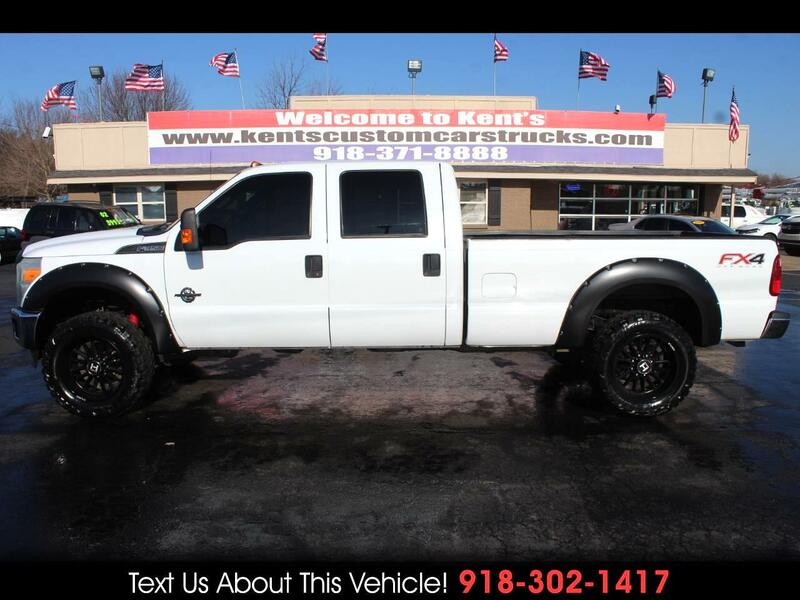 2012 Ford F-350 Super Duty XL Crew Cab FX4 4WD SRW Long Bed, Power Stroke 6.7L V8 Turbo Diesel Engine, 6-Speed Shiftable Automatic Transmission, Vinyl Seats, Vinyl Floor Material, FX4 Off-Road Package (Includes hill descent control, transfer case and fuel tank skid plates, off-road tuned shocks, and unique FX4 Off Road box decal. ), XL Value Package (Includes AM/FM stereo, single disc CD player, MP3 player, 4 speakers, clock, cruise control, chrome front and rear step bumper, bright chrome hub covers and center ornaments, and MyKey. ), Power Equipment Group (Includes accessory delay, power door locks, remote keyless entry, perimeter anti-theft alarm, power front and rear windows, one-touch driver side window, heated manual telescoping trailer tow mirrows with power glass, heated convex spotter mirror, and integrated clearance lamps and turn signals. Deletes passenger side lock cylinder. ), AC, Cruise Control, Child Seat Anchors, Tilt Steering Wheel, Tinted Windows, Power Steering, Power 4-Wheel Disc Anti-Lock Brakes, 3.31 Electronic Locking Axle Ratio, New Red Dirt Road 35X12.50R20LT Tires, New Hostile 20 inch Alloy Wheels. For more information give us a Call at 918-371-8888 or send us a Text Message at 918-302-1417. Message: Thought you might be interested in this 2012 Ford F-350 SD. Pricing and Information Disclaimer: All vehicle prices are subject to change without notice. This may be due to, but not limited to, accessories or options added by our accessory specialists.